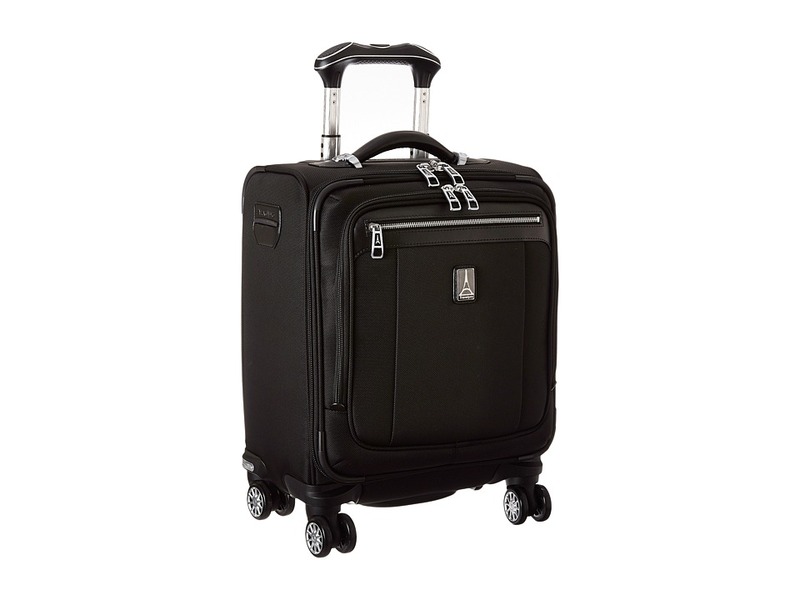 This Platinum Magna 2 - Spinner Tote is part of the Travelpro&amp#174 Platiunum Magna 2 Collection. Size requirements vary among airlines. Please check with your airline for carry-on luggage size restrictions. Perfect for the frequent business traveler or anyone that likes traveling with ease, this tote will definitely become your go-to bag for travel. Constructed from high density ballistic nylon fabric with DuraGuard coating which features stain and abrasion resistance for greater durability. Ergonomic zipper pulls open compartments with ease. Convenient ticket pocket on the front provides quick access to your passport, tickets, keys or a cell phone. Features leather top and side carry handles along with bottom handle cup for easy carrying. Expansion capability gives you and extra 2 of space when needed. Patented PowerScope Aluminum Extension Handle with stops at 38, 40 42.5. Zippered front pocket is perfect for holding magazines, travel souvenirs, paperwork, and even most laptops. One interior credit card slot. Self-aligning magnetic dual wheel spinners. Imported. Measurements: Width: 15 in Depth: 8 in Height: 18 in Weight: 7 lbs 12.16 oz Proposition 65 WARNING: This product contains chemicals known to the State of California to cause cancer and birth defects or other reproductive harm.